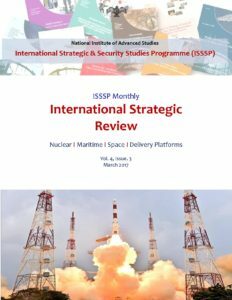 February 2017 was a busy month for Space related activities in China, North Korea, Iran and India. But the real highlight in February was India setting a new record by launching 104 satellites on single rocket. The ISRO has been consistently in the news making great strides with the most cost effective Mars mission in the world and its indigenously built cryogenic engine. Besides, the eleventh edition of Aero India was held at Air Force Station, Bengaluru from 14 to 18 Feb 2017, making way for new international collaborations for India. One of the most significant announcements at Aero India was the National Aerospace Laboratories (NAL)’s proposal to revive three aircraft programmes- Saras aircraft, 70 seater aircraft programme and the NM5-100.